| Italy | Police charges against workers won’t halt the struggle ! 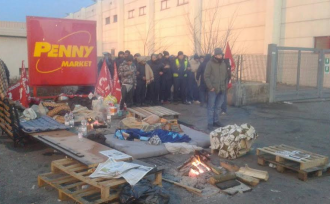 After four days of strike and permanent sit-in at the gates of the Penny Market warehouse in Desenzano del Garda, this morning [Saturday Jan. 9, 2016] 70 policemen have intervened violently charging the workers and clearing away the picket. The bottom line : 6 workers held at the police station and released after a few hours with a notice of investigation for inexistent crimes and three workers wounded during the charge. This police action follows yesterday’s farcical meeting at the prefecture, where the deputy prefect has enjoined the termination of the strike without opening an immediate union negotiation with the cooperative Servizi Associati and its purchasers, Penny Market. The current labour dispute follows a previous agreement signed a few months ago by the same cooperative and the workers, which has not been implemented by the employer, leaving working conditions and wages unchanged. Porters are over-exploited, with work days of up to12-13 hours, six days a week, at exhausting work paces and low wages. In addition, continual intimidation and threats of dismissals by the foremen of Servizi Associati and Penny Market. The current dispute arises from this conditions, which are typical of all logistic workplaces where workers are not yet organized with SI Cobas or ADL Cobas. A boycott campaign is being launched against the Penny Market food stores, with information material handed to customers and on the web. A few hours later the police have brutally attacked the workers picketing the gates of the Bormioli (a renowned glassware trademark) warehouse in Fidenza, in a struggle to maintain the wage levels they had achieved, after the change of contractor. 31 workers and 8 supporters have been taken to the police station and held there for up to seven hours to be identified, take fingerprints, and possibly be charged for resistance to public officer. The right to strike disappears and workers defending their working condition are beaten by cops and charged for violent offences against them. Bormioli workers, supported by SI Cobas like Penny Market’s, won’t let themselves be frightened and will continue in their struggles to defend their labour rights.